Markets ended at 3-month closing highs amid a broad-based rally led by financials after the cabinet on Thursday approved composite caps in several sectors. Meanwhile, the narrowing of trade deficit coupled with strength in the global peers after Greek parliament approved the austerity reforms boosted investor sentiment. 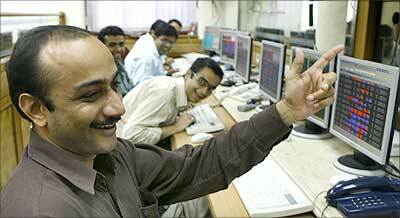 The Sensex closed at 28,446 levels up by 248 points and the Nifty surged 84 points to end at 8,608 levels. In the broader market, BSE Midcap and Smallcap indices gained 1.3% and 0.8% each. The market breadth ended strong with 1,567advances versus 1,249 declines on the BSE. BSE Midcap index hit a lifetime high of 11209.18 mark in today’s session to end at a fresh closing high of 11,198.24 on the back of buying by as foreign institutional investors (FIIs). "Nifty managed to close above a stiff resistance zone of 8550 today. Banknifty showing strength and outperforming today was the highlight. The most interesting aspect of the markets here is that a lot of largecaps and midcaps are showing life time high's, even though the indices are substantially away. It indicates the underlying strength in this uptrend" said Kunal Bothra, Head-Advisory, LKP Securities. Commenting on current market situation, Amar Ambani Head of Research, IIFL, said, “A host of initiatives by the government including the cabinet clearance of a proposal removing the distinction between different types of foreign investments through a composite cap gave a boost to the market. Expectedly, the Bank Nifty lead from the front. Nifty, which has struggled around 8550-8560 levels managed to blast past this resistance and close above the psychological mark of 8600. "Return of risk appetite after the Greek Parliament voted in favour of a new bailout plan provided bulls a shot in the arm. Besides, hopes that a fall in oil prices due to the Iran nuclear deal will lower import costs and interest rates added to the positive trigger" he added. The Cabinet cleared a proposal to merge the limits of foreign direct and portfolio investments into composite caps to make foreign investment regime easier. Composite caps have been suggested for sectors like agriculture, tea plantations, petroleum and natural gas, manufacturing, airports, real estate, telecommunications, mining, non-banking financial companies and pharmaceuticals. In some sectors where only FDI and FII investments are allowed, the department proposed investments by non-resident Indians and foreign venture capital firms with up to 100% foreign investment in asset reconstruction companies, 74% in private banking, 20% in public-sector banks and 49% in power exchanges. India’s trade deficit narrowed to 10.8 billion in June as compared to 11.7 billion in same month previous year. However, country’s exports contracted for the seventh straight month by 15.82 percent to $22.2 billion on account of slump in global demand. Greece's parliament approved the bailout package presented by prime minister Alexis Tsipras. Greece will now be required to implement a series of reforms, target specific budget surpluses, and submit to oversight from its creditors. All sectoral indices ended in green with BSE Healthcare, Bankex, Oil & Gas, Power, FMCG and Consumer Durables up between 1-2%. Shares of financials, pharma, oil & gas, manufacturing and mining companies gained across the exchange after Cabinet approved composite cap on foreign investments in various sectors. Also, the possibility of rate cut in the next monetary policy boosted the trading sentiments. Axis Bank, HDFC twins, ICICI Bank, SBI, YES Bank from the financial space surged between 0.8-4.2%. Meanwhile, Cipla, Sun Pharma, Dr Reddy’s Lb and Lupin from the pharma pack rallied between 0.5-1%. BHEL and L&T from capital Goods space gained 2.5% and 0.4% each and Coal India from the mining space gained 0.5%. Reliance Industries gained over 1% as it has entered the 2.7 million tonnes Indian Railways bulk diesel market, challenging state-owned refiners and marketers after a hiatus of nearly eight years. Tata Steel has climbed 0.3% as the pension dispute at their UK business that brought the company to the brink of the biggest industrial dispute in 35 years ended, according to media reports. Among other shares, South Indian Bank shares lost over 5% after the bank on reported a 48% drop in its profit for the June quarter. Net profit dropped to Rs.65 crore from Rs.127 crore a year ago. Hatsun Agro Product surged 10% after reporting a nearly four-fold jump in net profit at Rs 29 crore for the quarter ended June 30, 2015.